Netvibes founder Tariq Krim sent me a new screenshot of Jolicloud, the Linux-based Netbook-optimized operating system he’s building (we first covered Jolicloud last December). 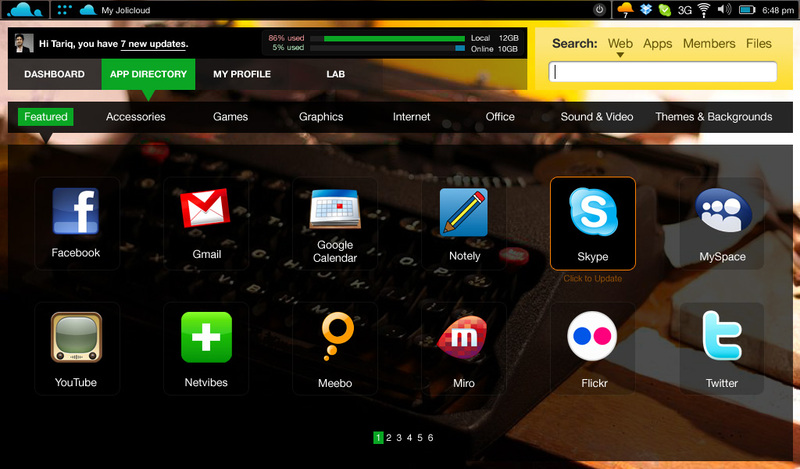 The screen shot, which is significantly evolved from what we saw in Paris, shows a set of featured applications that mixes desktop and cloud software – Facebook, Skype, Meebo and Youtube, among others, are shown with large icons that make it easier on Netbook users, who have to make do with smallish screens. Jolicloud will eventually support touchscreens, Krim told me. We’re trying to get a copy and install it on our CrunchPad prototype to see how it does, and share video.